Before I talk about my first holiday card for this year I'd like to tell you a little bit about Live Love Cards. I've been an admirer of Darlene DeVries for quite some time so when she came up with the idea to start a site that was all about cards and filled with lots of videos and monthly challenges for $2.50 a month or $27.00 a year I jumped right on that and haven't regretted it yet. I'm nowhere near Darlene's talent, but she's like me in one respect, she uses a lot of different products + Stampin' Up products. You get to partake of lots of different tutorials. If you love card making, tutorials, and a nice community of artists give the link above a click and take a tour. Now, on to this card. For some reason I was fixated on using this Stampin' Up stamp set-Santa's Gifts. It's been on my creative area most of this month. Looking, looking, thinking, thinking, hmmm. Finally today, a little light bulb moment. Inlaid die cutting. These are all Stampin' Up products so the rest of the post I will just use their name. I know you get it. A Real Red card stock base 4 1/4" X 5 1/2", background paper from Trim the Tree paper stack cut just a bit smaller for a nice border. I ran the second from the outside Framelits Labels Collection die through the Big Shot, 1st the background paper then some Whisper White card stock. I stamped my little scene with Black Momento Ink (Stampin' Up sells that now) and colored it with (sad face) the discontinued alcohol markers. Oops, there is a touch of sparkle with a Wink of Stella pen and on Rudolf's nose a Clear Stardust Gell Roll Pen and another Oops, Marvy White Liquid Applique for the fur on Santa's suit. It's amazing when you start breaking down a card the things you've reached for without realizing they weren't Stampin' Up. 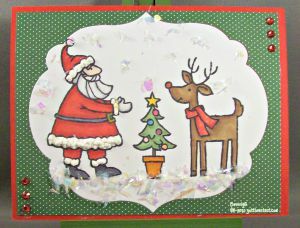 Well, on with the show, Tombow glue, and I don't know how old Mica Flakes from Stampin' Up. Inserted the scene into the cut out on the background paper, added the Basic Rhinestones colored with alcohol marker. Whew, hard to believe it took me so long to come up with this idea because I think it came out really cute. I'm dragging up the rear again on a challenge, but if you don't get in on the August Challenge and decide to join Live Love Cards Darlene has already given the hint for September--Sparkle and Shine. That might give you a bit of a head start. I've been a bit of a Chatty Cathy this evening, so signing off to go enter the challenge and close up the studio for this evening.